In a splashy reveal at Grand Central Station on Wednesday, DJI announced the Spark, a pint-sized camera drone that’s been rumored for weeks. The company says it’s about the size and weight of a soda can. You can also control it with the wave of a hand. This is an interesting—albeit unoriginal—promise. A new suite of gesture controls that DJI calls PalmControl lets the Spark take off from your hand, take a selfie, and then return to your hand. The Spark also features four Intelligent Flight Modes that are similar to those already available the Mavic Pro and the Phantom 4. In Rocket mode, the drone goes straight up with the camera pointed down. In Dronie mode, the drone flies up and away from you while keeping the subject in frame. Circle mode makes the drone do a circle around the subject. And Helix mode is like an upward spiral. DJI did not announce a Follow Me feature for the Spark, and it’s unclear if you need to connect the drone to a smartphone to fly with PalmControl. Ready for more specs? The Spark sports a 12-megapixel camera that can capture photos and video in 1080p resolution. The drone itself costs $500, and you can buy a combo pack that includes a controller, prop guards, two batteries, and a bag for $700. The Spark also comes in five colors: red, blue, yellow, neon green, and white. The rest of the details indicate that the Spark might also serve as an entry-level racing drone. It can fly up to 31-miles-per-hour, which is just a little bit slower than the Mavic Pro’s and Phantom 4's fastest modes. 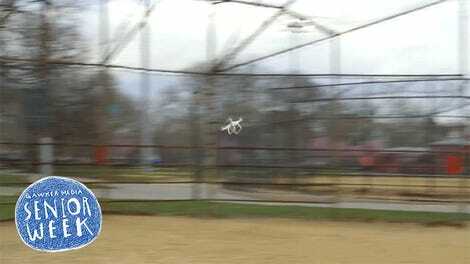 The drone’s so-called 3D Sensing System also uses front-facing sensors to keep it from running into obstacles. And, of course, the Spark will work with DJI Goggles, the $450 first-person view (FPV) headset that the company announced earlier this year. (DJI Googles still haven’t shipped yet.) The Spark’s battery life is a disappointing 16-minutes, and the range for video transmission is 1.2 miles when flying with the remote controller. It’s fun that DJI is finally offering a cheaper drone and planting a flag in the more democratic arena of flying cameras. The world’s leading drone company is noticeably late to the game, though. Yuneec, one of DJI’s biggest competitors in the drone space, released a very similar camera drone called the Breeze earlier this year. That pint-sized aircraft can shoot video in 4K and costs $400, a full $100 less than the Spark. Meanwhile, you’ve been able to buy the Hover Camera, a very tiny gesture-controlled camera drone, since last year. The Apple Store started selling the drones last month. 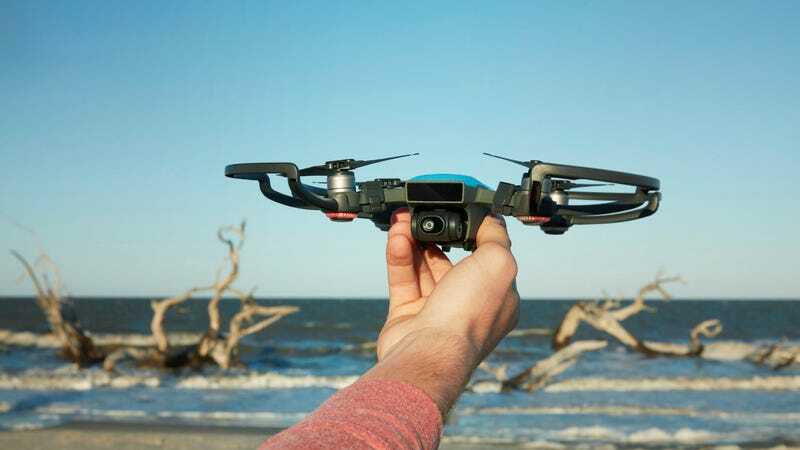 The form factor of the DJI Spark is also reminiscent of the Parrot Bebop, which has been on the market for about three years, and the ZeroTech Dobby, which fits in your back pocket. Is DJI’s entrance into the user-friendly flying camera drone too little too late? We’ll have to test it out alongside its competitors to know for sure. Meantime, drones are getting more exciting—and much smaller—by the minute.